We’re sorry. Really sorry. Sorry for two glaringly obvious omissions that we’ve almost completely neglected to cover since we kicked this blog over way back in 2009. What are we talking about? Gear and girls. ‘Gear’ as in showing you the latest moto outfits to keep you cool and safe. And ‘girls’ as in women riders a.k.a. the industry’s fastest growing segment. But fear not; from this day forward we’re going to be doing our best to rectify this. We’re calling it ‘First Gear’, and for our opening salvo we’re especially targeting all the ladies out there. Looking for some new gear? 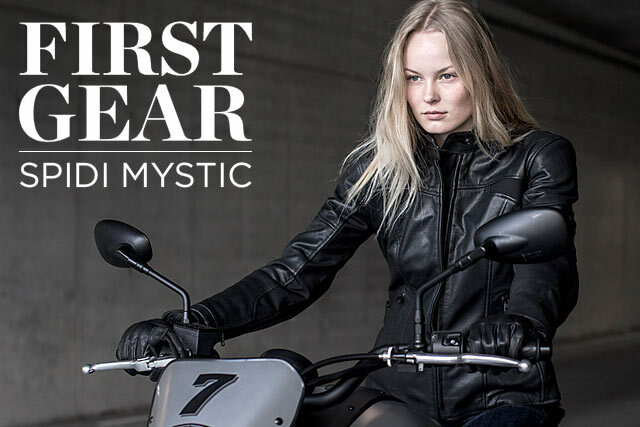 Meet Spidi’s new Mystic women’s jacket and gloves.